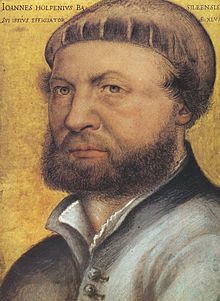 Hans Holbein the Younger (c. 1497 – uLwezi 1543) singumpendi weJalimani, ekhulunyaka 16. Igama lakhe "the Younger" ngoba ubaba lakhe uHans Holbein the Elder. ↑ Alastair Armstrong, " Henry VIII: Authority, Nation and Religion 1509-1540"
Portrait of Christina of Denmark, Duchess of Milan, c. 1538. Oil and tempera on oak, National Gallery, London. This page was last edited on 6 uNhlaba 2016, at 14:11.